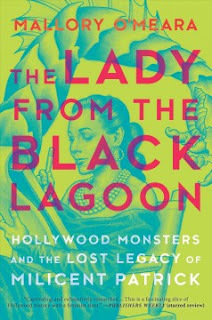 Staff Recommends @CMPL: Phil recommends "The Lady from the Black Lagoon: Hollywood Monsters and the Lost Legacy of Milicent Patrick"
Phil recommends "The Lady from the Black Lagoon: Hollywood Monsters and the Lost Legacy of Milicent Patrick"
Frankenstein’s Monster, Dracula, The Wolf Man, The Mummy, The Invisible Man, and the Creature from the Black Lagoon were all famous Universal Classic Monsters in the Golden Age of Hollywood. However, there was something unique about the Gill Man, The Creature from the Black Lagoon, a secret that had been kept for decades – he was created by a woman. In an industry dominated by men and rife with sexism (in the 1950s and even today) Milicent Patrick quietly made her statement by creating one of the most beloved creatures in horror film history - while her male boss stole all of the credit. Author, screenwriter, and film producer Mallory O’Meara embarks on a quest to set the record straight and to find out all she can about this little known animator and pioneer of special effects design. O’Meara’s quest takes her from Hearst Castle in San Simeon, California to the hallowed halls of the Walt Disney Archives as she pieces together the life of an unsung Hollywood hero. I still remember seeing “The Creature from the Black Lagoon” in 3D with my parents at the Detroit Institute of Arts and again on the Svengoolie show while I lived in Chicago. It is a nearly flawless classic horror movie and I enjoyed learning about this little known piece of movie history. Miss Lynn recommends "Piecing Me Together"